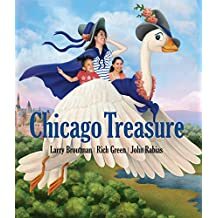 Chicago Treasure is a clever collection of diverse and disability-inclusive photographs of children digitally imposed onto fairy tale images, well-known works of art, and popular Chicago landmarks. This beautiful, full-color, book contains over 150 captivating images. Larry Broutman is responsible for the concept as well as photography and text, Rich Green produced illustrations and text, and John Rabias created the digital effects. In the first section, Just Imagine!, original images are paired with abridged versions of classic stories like Riding Hood and Sleeping Beauty as well as updated nursery rhymes. In one image, a young girl sits in a wheel chair as a delighted Prince Charming kneels before her. In another image, a toddler relaxes precariously beside Humpty Dumpty on a wall. In a third, a young blond girl with glasses makes an adorable Miss Muffett as she reaches for the spider that sat down beside her. Less familiar tales, such as Pear Blossom and the Dragon, based on a Chinese legend, introduce readers to diverse stories. In the second section, Now Showing!, children step into popular paintings, including Grant Wood’s American Gothic and Edward Hopper’s Chop Suey. Some of the children fade into the landscape as if they belong, while others clearly do not. The final section, Sightings!, melds fantasy and reality as adorable children and scary creatures wander the Chicago landscape. In one image a young person walks a porcupine and a skunk. In another image, a woman walks a panda. In still others, families ride bears and zebras around town. The ages, races, and abilities of children are refreshingly diverse, disrupting the whiteness and able-bodiedness ubiquitous in most story books and museums. I’m a bit disappointed that gender norms were not challenged more, but overall, I am thrilled this beautiful book exists. I recommend Chicago Treasure for personal collections. It makes a lovely coffee table book likely to encourage thoughtful conversations. It will also be a great addition to classroom libraries. Many lessons can be planned around the book in areas like art appreciation, disability awareness, and cultural diversity. It’s a delightful book that does a lot of work, literally disrupting dominant narratives by replacing images of able-bodied white people with a far more diverse cast of characters. Many of the models are students at Chicago Lighthouse for the Blind and Visually Disabled’s preschool and author proceeds will be donated to the Chicago Lighthouse for the Blind and Access Living Chicago. I was provided a review copy of this book.